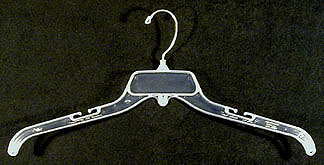 This "general purpose" hanger is made of clear or black plastic with a bright metal swivel hook. It measures a full 19" — at least 2" wider than the type usually sold in stores. Great for plus size shirts, sweaters, or dresses. If you order these hangers, be sure to check out the non-slip Hanger Hugger accessory! Hangers cannot be shipped economically by air. If you order these hangers and specify second day air, next day air, or priority mail, we will ship them by ground and refund the appropriate portion of the S/H charges that were billed to your card that represented the air portion of the charge. Because of the size of the cartons that must be used to ship hangers, the air shipping charges from UPS or priority mail from the US Postal Service become comparable to, or even exceed the cost of the hangers themselves. Because virtually all international mail is by air, it is expensive to ship hangers to destinations outside the U.S., more so these days due to high fuel surcharges for air transportation. Such orders cannot be economically shipped by ground to Canada or Mexico, either, due to high customs brokerage fees that apply to parcels that are not passing through the postal system. If you live outside the U.S. but wish to order hangers anyway, we will be happy to ship them by mail, but will need to follow up your regular order billing with a second invoice for an S/H surcharge, which may be comparable to the original S/H estimated from the chart, or the S/H that appears on your confirmation email.